This Signature Edition includes the complete Old and New Testament, along with the Through the Bible in a Year Weekly.Narrated by Kelly Ryan Dolan. What would the Bible sound like if it was written today? If God’s Word doesn’t grab you, perhaps you’re not really seeing and hearing it. Revitalize your devotions with the power and punch of Eugene Peterson’s fresh translation, directly translated from the Greek and Hebrew texts and intentionally designed to be a reading Bible rather than a study Bible. 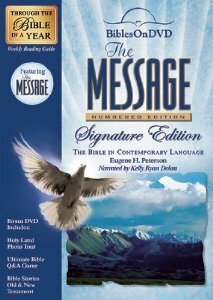 The Message on DVD combines numbered on-screen text with Kelly Ryan Dolan’s down-to-earth reading of this best-selling paraphrase of the Old and New Testaments to bring you the Bible in a brand new way.